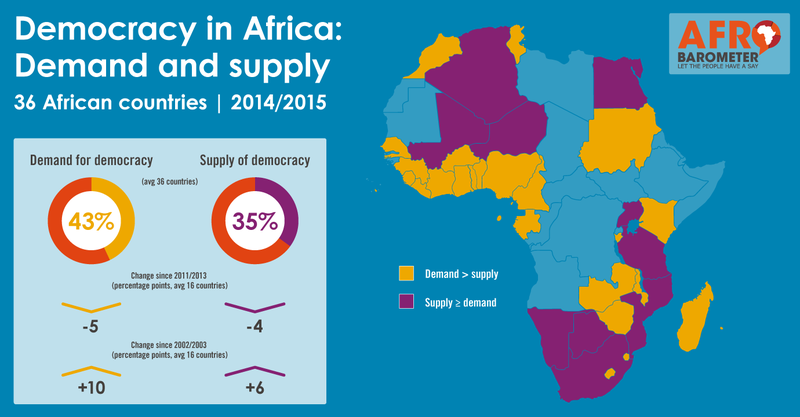 Publications > PP36: Do Africans still want democracy? PP36: Do Africans still want democracy? Judging by media headlines, democracy appears to be under stress everywhere from leaders like Vladimir Putin in Russia, Recep Tayyip Erdogan in Turkey, and Yoweri Museveni in Uganda. Yet social scientists know there is often a mismatch between what can be gleaned from news reports or social media and real, underlying trends. To take just one example, media attention to wars in Syria and Iraq suggests rising conflict around the world. Yet compared to previous centuries and especially since the end of the Cold War, both international and civil conflicts are at record lows (Human Security Report Project, 2014). A similar contrast exists between media-fueled perceptions and actual trends in global poverty. The common wisdom suggests worsening living conditions on an overpopulated planet, whereas evidence-based indicators demonstrate that, between 1990 and 2010, the global rate of extreme poverty was cut in half (Economist, 2013). Might the same type of discrepancies exist with regard to democracy? Especially in Africa, where many presidents cling to power (as in Cameroon, Democratic Republic of the Congo, Rwanda, Uganda, and Zimbabwe), manipulate elections (as in Burundi, Gabon, and Zambia), or ignore institutions of public accountability (as in South Africa), one might reasonably conclude that democracy in Africa is only a façade erected to please a credulous audience in the rest of the world. Yet this viewpoint would miss the fact that more than half of all Africans today live in functioning multi-party electoral democracies that are demonstrably freer than the military or one-party regimes that previously dominated the continent. At the same time, the post-1990 gains that African countries registered in terms of civil liberties and political rights peaked in 2006, at least according to expert judgments offered by Freedom House. Click 'Download now' for the full report. For the press release, click here.